2/19/2010Share this story on Facebook! Students in STOIC (Sword Team of Ithaca College) practice their form. Photo by Caylena Cahill ’10. Can any of these IC clubs pry you away from Mario Kart -- again? Are You a "Twilight Zone" Fan? Its creator, Rod Serling, taught at Ithaca College, and the Roy H. Park School of Communications now houses the Rod Serling archives and hosts a conference dedicated to his work every other year. The nice thing about Ithaca College is that geek can be chic. Whether you enjoy playing board games or video games, browsing bookshelves or cyberspace, you can find other students here at IC who do too. Go ahead -- embrace your inner nerd. Computer nerds are a thing of the past. Information Technology Services employs more than 100 students part-time in 15 different areas. You can gain professional work experience while coming to the rescue of your peers and impressing them with your computer savvy. Whether your interests are in web development, technical support, video and photography, troubleshooting, or digital media, or if you’d just like to teach -- students run workshops -- there are plenty of options for you to become involved and make extra money. Although English professor Katharine Kittredge is the instructor of Futuristic Fictions: DIY SciFi, she’s not the only one doing the teaching. The semester is divided into mini classes, with small groups of students immersing themselves in a science fiction topic of their choice and then presenting the strongest elements of their research to the class. Because students have such an impact on the syllabus -- they’ve chosen such subjects as time travel, alternative history, images of divine beings, and space colonization -- “they are active participants in their own education,” says Kittredge. And because the class is so hands-on, it’s an entirely different experience each semester, with student presenters sometimes even dressing up like monsters! Do you envy the Knights of the Round Table, worship Captain Jack Sparrow, or idolize legendary characters like Zorro? Then check out STOIC, which teaches different styles of swordplay in choreographed dances and free-form sparring sessions. Although STOIC’s main goal is to research and learn about the art of swordplay, it’s a great place for a unique form of exercise. 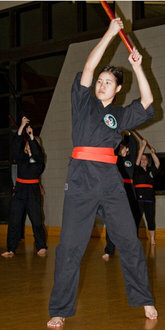 The team practices kenjutsu (the art of the Samurai sword) and stage combat, using wooden replica swords for form practice and soft foam swords for sparring practice. Interested, but worried that fencing’s not on your resume? No worries. If you’ve watched Pirates of the Caribbean (or even Peter Pan), that’s experience enough! Looking for something that exercises the mind more than the body? Dedicated to providing an intellectual forum for science fiction and fantasy enthusiasts, Other Realms meets for games nights (from the new-school Settlers of Catan or Blokus to the old-school Monopoly or Candyland), movie outings, and book readings and discussions. Cartoons aren’t just for kids. The Anime Society of Ithaca College is devoted to the celebration of Japanese culture through animation. In Japan, animation covers genres from science fiction to horror, westerns to sports, and everything in between. With ASIC, you can study the allegories, symbolism, and metaphors found throughout these imaginative films. You can also enjoy Japanese anime in other mediums such as manga (Japanese comics), television series, video games, and Internet-based releases. You don’t have to run away to join the circus -- there’s one right here on campus. And you might even get to play with fire. Performing anything from fire to spinning acts for the IC community and occasionally in New York City, the circus club of Ithaca College is dedicated to teaching, performing, and training in circus arts.